SAN NARCISO, Calif. (Bennington Vale Evening Transcript) -- It's been more than a year since the FBI reported no findings of evidence to substantiate racial bias in George Zimmerman's history or his shooting of a black Florida teen, Trayvon Martin. Yet Attorney General Eric Holder has tasked the Justice Department with trolling for email tips on the newly acquitted neighborhood watch volunteer from Sanford, Fla., as it considers a federal civil rights case against Zimmerman. Critics say Holder is bowing to pressure from Democratic lawmakers, civil rights leaders and organizations such as the NAACP. The National Rifle Association (NRA), which has spent large sums lobbying for lax gun controls and Stand Your Ground laws, blasted the Justice Department's efforts, stating that self-defense is a "fundamental human right," which ostensibly trumps the rights to life and liberty, as well as walking down the street with Skittles and iced tea. NRA Executive Vice President Wayne LaPierre went so far as to posit, "Jesus Christ would be alive today if he'd had a gun." In 2005, LaPierre praised Florida's passage of Stand Your Ground as "the first step of a multi-state strategy." The state's original Stand Your Ground legislation was drafted by Marion Hammer, a former president of the NRA. Gun rights supporters insist that Stand Your Ground is the only reason George Zimmerman remains alive today. "Zimmerman's life was in danger at the very instant Trayvon Martin menacingly brandished a bag of candies and a suspicious bottle of iced tea," said Thorn Havershabe, head of the San Narciso County chapter of the NRA. "He could have crammed the Skittles down Mr. Zimmerman's throat and choked him to death. He could have used the tea to waterboard Mr. Zimmerman. The fact is, Martin attacked -- and he was armed." Zimmerman's attorney, Mark O'Mara, told reporters that his client needs a firearm "now more than ever" to protect him from angry protesters. O'Mara also claimed that Zimmerman never would have faced trial had he been black. And in April 2012, O'Mara equated the injuries sustained by Zimmerman to Shaken Baby Syndrome. "When we think of Shaken Baby Syndrome, it's easy to fault the British nanny and weep over the loss of a seemingly innocent infant," O'Mara explained. "But we don't really know what the baby did to provoke the shaking. Maybe it was possessed. Maybe it had gotten hold of Skittles. People get caught up in the size difference between a baby and a curvy English lass. They never stop to think about the injuries a baby can inflict on a nanny while it's being shaken. Best case scenario, the nanny walks away with sprained wrists and bruising. But sharp fingernails and newly cut teeth can cause serious lacerations, which can become infected. If left untreated, gangrene and death are not far behind. That's a pretty scary thing to face, especially knowing that you're going to be deported to a country with a medieval socialized health care system." Some analysts believe Zimmerman's acquittal raises difficult questions about the potential of more Zimmermans, not an outbreak of race riots. But many legal experts say the harder question not being addressed is how the foundations of our legal system could be negatively affected by a moronic lawyer like O'Mara getting a win for this case. The NRA, for its part, believes the only solution is more guns. "We live in an increasingly dangerous world," LaPierre observed. "Mass murders are increasing but statistics show a continual decline in the number of households that own weapons. This is no coincidence. Had elementary students been armed at Sandy Hook, had moviegoers in Aurora, Colo., brought firearms to the premiere of 'Batman' instead of popcorn, more people would be alive today." LaPierre even noted that Trayvon Martin, whose life was cut tragically short, may have survived the deadly encounter with Zimmerman had he been carrying a gun. "Let's face it," LaPierre added, "Our Lord and Savior, Jesus Christ, would still be here in the flesh if he'd been packing heat instead of heart." According to Gospel harmony, Jesus was arrested in Gethsemane after the Last Supper. He was made to stand trial before the Sanhedrin, Pontius Pilate and Herod Antipas. He was found guilty of blasphemy under Mosaic law, which carried a sentence of death. After being flogged, Jesus was mocked, clothed in a purple robe, crowned with thorns, beaten and spat on. His captors then paraded him through town as he carried his own instrument of execution to the crucifixion site. 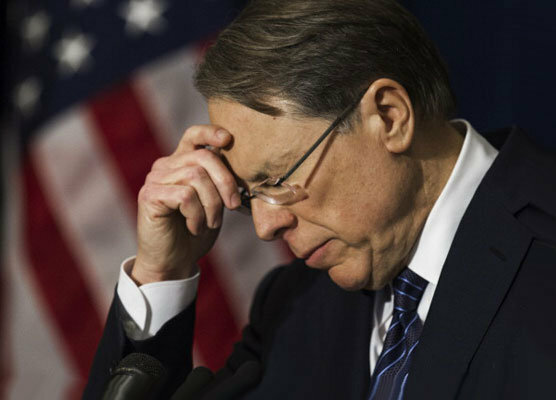 Wayne LaPierre called Jesus' death "a preposterous, unnecessary and preventable tragedy." "Sure, in many ways the Jews were outranked by heavily armed and well-trained Roman soldiers, but Rome wanted nothing to do with this case. Pilate washed his hands of the public's decision to execute Christ," LaPierre said. "The Jews had nothing. No weapons, no army to speak of. Yet, Jesus was beaten, brutalized, degraded and nailed to a cross. Even with the sword- and spear-wielding Romans, our research suggests that Jesus could've taken every single one of those guys out with a simple .9mm pistol. Of course, Jews were outlawed from owning such devices because of concerns about revolts or political discord. And that's exactly what the Second Amendment is there to prevent. If Jesus had been armed, God's only son would still be among us, and none of these violent acts would be occurring. And gays would still be banished. So, it seems we remain doomed to repeat history's mistakes. Guns are our only chance at salvation."